“Some Philosophical / Religious / Scientific Precursors (More or Less) of the Work of Wilhelm Reich,” by David Brahinsky, Ph.D.
Dr. Brahinsky reviews a range of concepts and observations from ancient and modern natural philosophy and from various cultures and religions that can be understood as in some ways anticipating Wilhelm Reich’s clinical and scientific findings. “The Mechanistic Distortion in the Treatment of Infants and Children,” by Morton Herskowitz, D.O. In an article first published in 1964, Dr. Herskowitz reviews the historical roots of modern medical practices in the treatment of infants and children, and the harmful impact of such routine hospital practices as the separation of infant from the mother after birth, and circumcision. “Wilhelm Reich: Studies of Earliest Childhood,” by Morton Herskowitz, D.O. 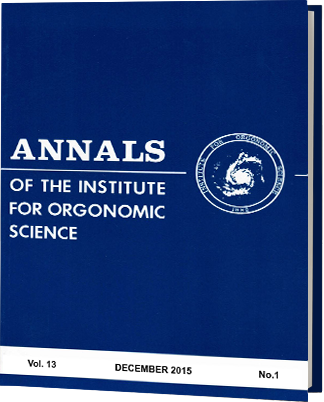 In an article first published in 1996, Dr. Herskowitz reviews Wilhelm Reich’s contributions to neonatal research in the Orgonomic Infant Research Center, describing clinical case studies by Reich and his colleagues that shed light on the early development of armoring in infants and on the application orgone therapy in labor. Jones outlines an orgonomic theory of labor and draws on his 15 years of clinical experience as a midwife in the British National Health Service to describe the effectiveness of orgone therapeutic methods in childbirth. The authors present evidence for a catalytic effect of the orgone energy accumulator on an esterification reaction between l-glutamic acid and methyl alcohol. A high yield of the methyl ester product was detected with HPLC in accumulator-treated vials, but was undetectable or of a negligible quantity in untreated controls. This piece was originally written in 1968 and published as the final chapter of the author’s 1970 book, The Taste of Color – A Touch of Love. In it, the author, a former student of Wilhelm Reich, draws on his own experience as an artist and his knowledge of Reich’s work to describe how an art teacher can facilitate the natural unfolding of artistic creativity of children. Also included are color reproductions of five of the author’s paintings. Commentary on Social Issues: “Progress in the Juvenile Justice System,” by Dorothy Burlage, Ph.D. The author, a child psychologist, draws on Reich’s work to describe the negative effects of incarceration on human development. She discusses recent U.S. court rulings that have outlawed capital punishment of juveniles and limited solitary confinement and the length of sentences for juvenile prisoners. Book Review: Wilhelm Reich, Biologist by James E. Strick, Ph.D. reviewed by C. Grier Sellers, Ph.D. This first book-length scholarly appraisal of Reich’s scientific work in Norway, including his electrophysiological studies of human emotion, his bion experiments on the origin of life, his theory of cancer, and experiments with SAPA bions that led to the discovery of orgone energy is reviewed here by a biologist.